Posterior Compartment of The Leg is the biggest osseofascial compartment of the leg. Anterior: Posterior surfaces of the tibia, fibula, interosseous membrane, and posterior intermuscular septum. Posterior: Deep fascia of the leg extending from the medial border of the tibia to the posterior intermuscular septum. The posterior compartment of the leg is subdivided by two powerful transverse fascial septa (superficial and deep) into 3 parts: superficial, middle, and deep. The superficial transverse septum is connected medially to the medial border of the tibia and laterally to the posterior border of the fibula. The deep transverse septum is connected medially to the proximal part of the soleal line and vertical ridge on the posterior outermost layer of the tibia, and laterally to the medial crest of the fibula. Superficial part (between superficial transverse septum and deep fascia) includes gastrocnemius, soleus, and plantaris. Middle part (between superficial and deep transverse fascial septa) includes flexor digitorum longus, flexor hallucis longus, and posterior tibial nerve and vessels. Deep part (between deep transverse fascial septum and posterior surfaces of interosseous membrane, tibia, and fibula) includes tibialis posterior. Muscles: Superficial and deep groups of the muscles. Arteries: Tibial and peroneal arteries. 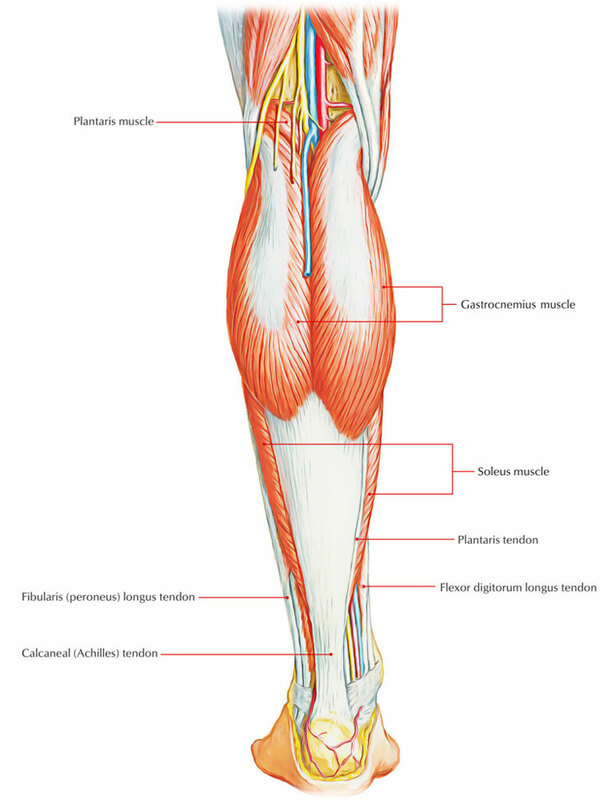 Superficial and deep muscles of the posterior compartment of the leg.